Should I get one? If so, is there a good (i.e. useful and not exorbitantly expensive) gauge to get? I've got one, the previous owner put it in before I owned the truck... and I don't even have boost. ClutchDisc wrote: I've got one, the previous owner put it in before I owned the truck... and I don't even have boost. Do you use it for anything other than impressing your passengers? "Oh, look! We're at -10 PSI boost! I bet you can't get that in your car!" ClutchDisc, that's a vacuum/boost gauge. Previous owner used it for vacuum gauge duty only, obviously. It can be useful, but nowhere near as useful as some people think in a modern fuel-injected engine like yours. Its position appears just right for dekneecapitating you in a crash. I have a vacuum gauge for my car, but mine has a mechanical carburetor for which vacuum is one of the most important control signals. 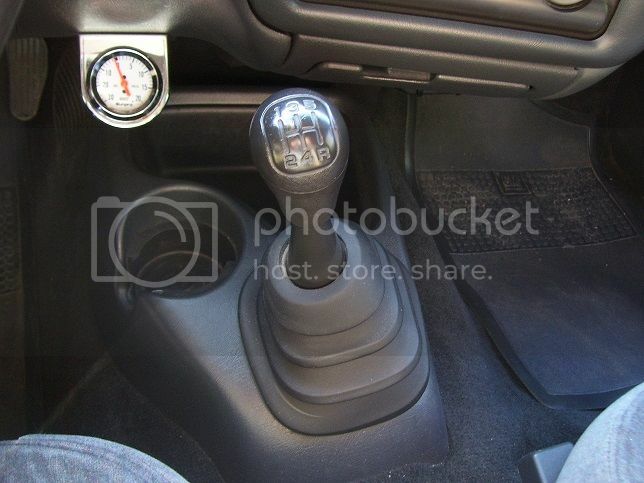 zenfiz6, I suspect that a boost gauge can be mildly useful in an unmodified car with OEM turbo and is quite necessary in a car that has an aftermarket turbo, or an OEM turbo with its boost cranked up, or heavy modifications. All turbo cars should have a boost gauge, in my opinion. Why? Well, it's an extremely useful gauge to have. It will alert you early on if you have a boost leak that develops. And don't underestimate the usefulness of the vacuum gauge that's part of the boost gauge. A good vacuum gauge is an incredibly important tool for any mechanic. If you have any doubts, just look up how many conditions that can be diagnosed with just a vacuum gauge. But to answer you question---no, you don't need a boost gauge. If you did, Audi certainly would have provided one in the first place. Is it a useful gauge to have? Absolutely. For many reasons. That said, ECS just recently came out with a relatively inexpensive boost gauge for the B8 Audis. It's a vent-mounted gauge, very similar to the AWE unit, but it uses a different vent and it's less expensive. I use ScangaugeII in my car - I've been using it for a couple years now. It provides a large number of very useful gauges, including boost. Ultragauge is a good alternative, too. It also provides a lot of the same gauges that Scangauge does, but looks a bit more modern and costs less. No, but almost anyone who rides in there asks what it is..
theholycow wrote: ClutchDisc, that's a vacuum/boost gauge. Previous owner used it for vacuum gauge duty only, obviously. It can be useful, but nowhere near as useful as some people think in a modern fuel-injected engine like yours. Its position appears just right for dekneecapitating you in a crash. Yea, I know. It is in a very odd location. But it's over enough that I think it would be pretty hard to hit it in a crash.. the picture makes it look like it's closer to the knee area than it really is. I'll second the OBDII recommendation. ScanGauge II, ScanGaugeE, UltraGauge, or even better (but more trouble; also far less cost) a smartphone with Torque and an OBDII bluetooth dongle. I have this one: http://www.amazon.com/dp/B005NLQAHS but this one is half the price and may be the same http://www.amazon.com/dp/B004B7YXOM -- but both are a fraction of the price of a ScanGauge II, which I also have and which is nowhere near as capable or useful. The UltraGauge may be less expensive than the SGII, and the SGE is definitely less expensive but is kinda lame by comparison. theholycow wrote: I'll second the OBDII recommendation. ScanGauge II, ScanGaugeE, UltraGauge, or even better (but more trouble; also far less cost) a smartphone with Torque and an OBDII bluetooth dongle. That's OBDII in general, not Bluetooth. My ScanGaugeII's refresh rate is actually worse than the bluetooth device, but that's not because of Bluetooth, that's just because of better OBDII hardware in that device than in the SGII. My dad has a bluetooth OBDII reader that works with an app on his phone. His (and I don't know the app name) works were you can buy all of the codes for 1 car for relatively cheap, or unlimited cars for like $30-40. And the reader itself is dirt cheap compared to other readers. I don't know about monitoring functions like is applicable here, but his is useful from the maintenance side of things (and can reset codes, too). SG lags a bit, but for fear of stating the obvious - have you increased the refresh rate? You can do that on the SG. It's set to 'normal' from the factory and you can increase to 'high'. Squint wrote: My dad has a bluetooth OBDII reader that works with an app on his phone. His (and I don't know the app name) works were you can buy all of the codes for 1 car for relatively cheap, or unlimited cars for like $30-40. And the reader itself is dirt cheap compared to other readers. I don't know about monitoring functions like is applicable here, but his is useful from the maintenance side of things (and can reset codes, too). That sounds awfully expensive. A $10-20 OBDII Bluetooth dongle and the $5 Torque Pro app can do all of that, as well as a bunch of data logging. The free Torque Light can probably do most of it too. AHTOXA wrote: SG lags a bit, but for fear of stating the obvious - have you increased the refresh rate? You can do that on the SG. It's set to 'normal' from the factory and you can increase to 'high'. Been there done that. I don't remember if it wasn't a very big help or if it wasn't compatible. Anyway my point was that Bluetooth doesn't introduce lag.